American manned spacecraft. Study 2005. The Andrews Crew Exploration Vehicle (CEV) design adopted NASA's preferred Apollo CM re-entry vehicle shape, but combined it with a mission module crew cabin to minimize the CEV's mass. Status: Study 2005. Gross mass: 21,057 kg (46,422 lb). Height: 10.00 m (32.00 ft). Diameter: 4.50 m (14.70 ft). Andrews' CEV concept was an Apollo-type re-entry module, used together with a forward cylindrical mission module, an aft orbital transfer vehicle for propulsion, and a launch escape system abort tower. The capsule, while only 4.5 m in diameter, would meet NASA's objective of allowing return of four crew normally, and six in the role of a space station life boat or ferry. The CEV would be capable of unmanned remote operation, including rendezvous and docking, in order to serve as a rescue vehicle, a payload delivery/return vehicle, or to dock with an LSAM lunar lander. For lunar missions, a standard orbital transfer vehicle (OTV) would be used; for lifeboat missions a more modest 4.5-m-diameter Service Module would be used. An expendable booster for the Earth to Orbit (ETO) Segment, which would consist of two lateral Zenit-2 boosters and an Atlas V Core stage, topped by a Lox/LH2 Expendable Upper Stage (EUS). 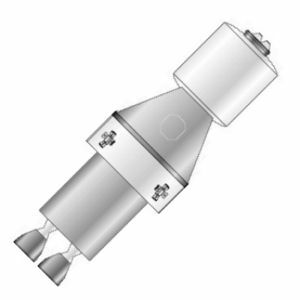 This Expendable Common Booster (ECB) could deliver a 22,000 kg CEV to translunar injection or 40,000 kg of cargo to low earth orbit within a 5 x 2 0m fairing. Development cost was not estimated. Cost per launch would be $240 million. A reusable Crew Exploration Vehicle (CEV) to take crews to the L1 Transfer Hub and return them to earth. It would be powered by an OTV (orbital transfer vehicle) stage. A reusable LEO-L1 Tug (LLT) that would deliver 63,000 kg from LEO to L1 and return 15,000 kg from L1 to LEO. It would have a stowed envelope of 5 x 10m, and be powered by a solar electric (Hall or ion) engine using xenon propellant. Propellant for a particular mission would be launched with the mission payload to low earth orbit. The tug would then rendezvous with the payload, and use the propellant to take the payload to L1. The tug would be equipped with a 300 kW solar power array, using solar concentrators to reduce cost, and a manipulator arm for payload berthing. A transfer mission would take 180 days taking advantage of n-body trajectory flybys of the moon and earth, or 320 days using conventional orbital mechanics. Critical technology that would have to be developed included 100+ kW electric thrusters, highly packageable solar array / concentrators, and low-cost hardened solar cells, The LLT's SEP propulsion unit would have an ideal delta-V of 3.4 km/s, a mass of 4,456 kg, a specific impulse of 3850 seconds, and a thrust of 11.9 N. Development cost would be $6.318 billion, with first unit cost being $223 million and an annual operating cost of $13.7 million. The tug would rendezvous with a payload and propellant combination with a total mass of 91,452 kg. Of this, 78,284 kg would be payload, and 12,260 kg propellant and propellant tankage. Much of the payload delivered to L1 would be water, which would be converted to liquid hydrogen and oxygen there, and used for rocket propellant. Development Cost $: 6,456.000 million. Unit Cost $: 284.000 million. Cost Notes: First unit cost; 2005$; ops cost $62.1 mn/mission.. Crew Size: 6. Habitable Volume: 12.00 m3. Family: Lunar Bases, Manned spacecraft, Moon. Country: USA. Spacecraft: CEV Andrews MM, CEV Andrews OTV, CEV Andrews RM. Launch Vehicles: Andrews ETOS. Agency: NASA, Andrews.